Heading up for Oktoberfest or fall colors? Stop by the village to see these fall favorites. Big Bear in the summertime? You just might picture hikers, wildflowers, sunny picnics, and bright days spent enjoying the Scenic Sky Chair. Big Bear in the wintertime? Skiing springs to mind, and tubing opportunities, and snowy drifts ready-made for building snowmen. But Big Bear Village come the fall? If you just shouted "lederhosen" and "scarecrows," you're right in the right area of revelry. 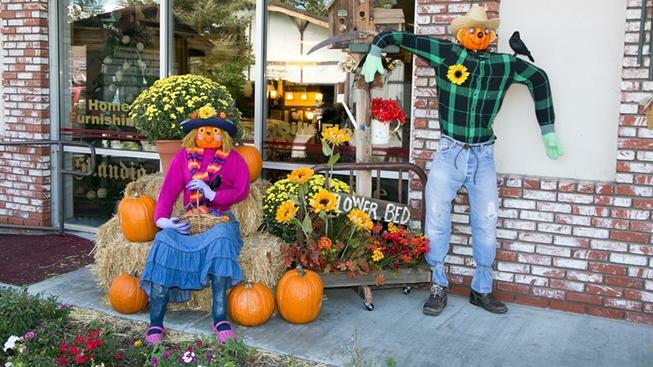 For the mountain-high location is charmingly known for both its weekend-wonderful Oktoberfest around the start of autumn, and its Scarecrow Festival, which fills the shopfronts of the village with a seasonal rakishness over several colorful weeks. That festival is on now, through Sunday, Nov. 4, so best head up, up, up to the area to spy the "... friendly, free-of-charge competition between merchants, non-profit groups, and other community-based service clubs and organizations." Have a favorite or two? There are six categories to weigh in on, and ballots will be available at various places around Big Bear Village. Those categories include Spookiest, Most Traditional, Best Reflection of Big Bear, Best Use of Recycled Materials, Most Reflective of Business or Organization, and Most Humorous. Just be sure to drop your picks in a ballot box by the day before Halloween 2018. Looking for some Big Bear zing with a dose of autumnal flair? Head up the big mountain, as the leaves change, for a walk-by some of the quaint fall figures currently populating the forever-quaint village. It's all free to see, too.